I think I’ve said it a few times before, but fried chicken is one of my favorite foods of all time. Whether it’s buttermilk fried chicken, Korean fried chicken or Japanese fried chicken, there’s a warm fuzzy place in my heart for each and every one. As the name implies, Ponzu wings are the Japanese cousin of Buffalo wings. Deep fried and doused in a tangy spicy sauce that clings to each wing. It’s similar to Karaage, but uses a simpler marinade with the bulk of the seasoning coming from the Ponzu, a Japanese citrus sauce. The potato starch on the outside won’t stay crisp after being doused with ponzu, but it helps the chicken hold onto the tangy sauce while thickening it enough to form a dark shiny glaze. While it may seem like a lot of work, butterflying the chicken drumlettes does a couple of things. The most obvious is that it makes them a lot easier to eat. It also makes them cook faster and more evenly since the meat is the same thickness. 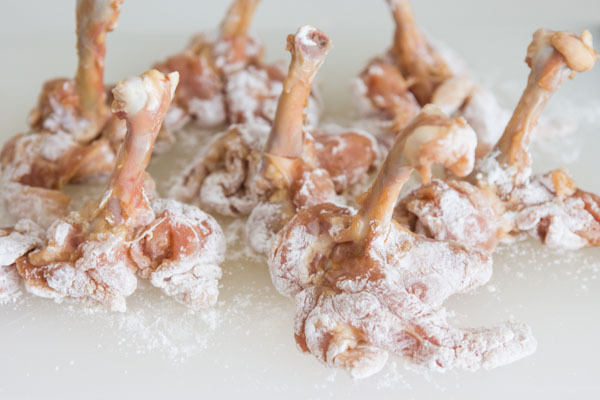 Lastly, whether you’re marinating, breading, or coating in a sauce, butterflying the drumlettes exposes more surface area for flavor to be absorbed. I served the wings with curls of tamed scallions. They not only make for an attractive garnish, but they also taste great with the chicken. Soaking shredded scallions (or any onion for that matter) for about 12 hours will mellow out the sharp raw onion taste. The problem is that it requires a lot of forethought for a garnish. As it turns out, soaking them in a solution of baking soda and water neutralizes the sulfur compounds, taming the onions in as little as 15 minutes. 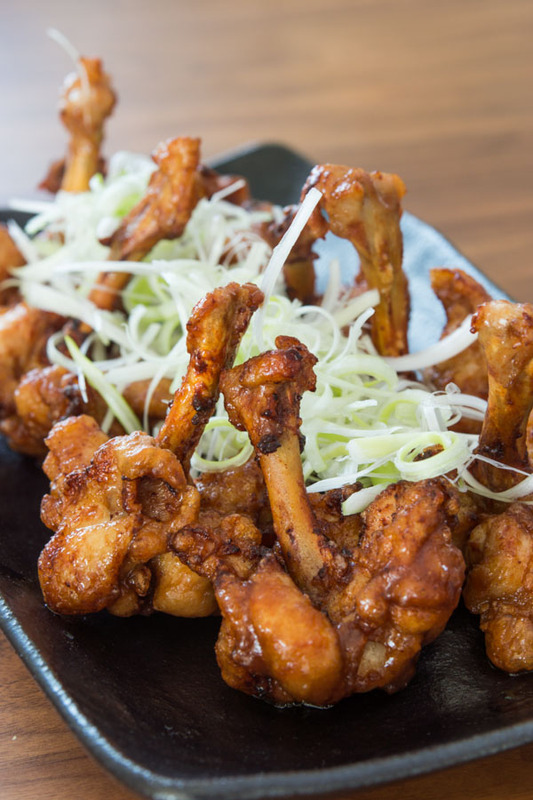 Citrus-based ponzu chicken wings are the Japanese cousin of Buffalo wings according to food blogger Marc Matsumoto from the Fresh Tastes blog. In a small bowl, combine the mirin, soy sauce and garlic. To butterfly the drumlettes, you want to make 3 slits from end to end as if you were cutting an orange into 3 wedges. Using a sharp knife, look for the grooves between the muscles and make an incision from one end of the drumlette to the other, cutting all the way down to the bone. Look for two more grooves and make the same incisions. 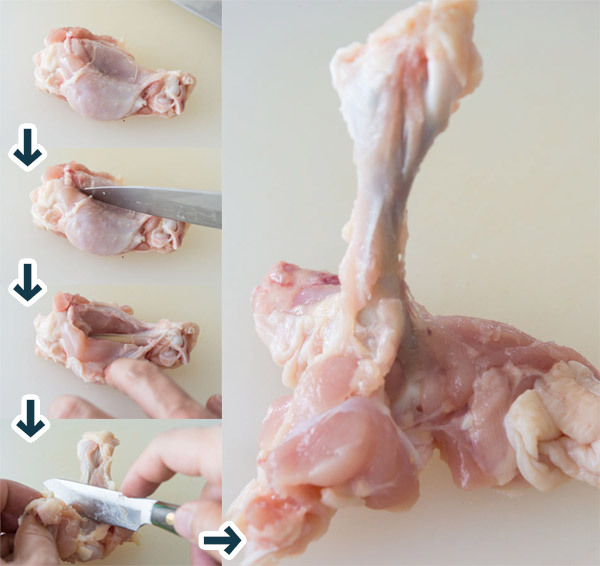 Separate each wedge of chicken from the bone by inserting the knife between the meat and the bone with the blade facing towards the top (end with less meat) and cut the meat away from the bone completely. Repeat for each wedge. Stand the drumlette up, with the meat end on the cutting board and use your knife to scrape the meat away from the bone until the drumlette stands up on its own, but do not cut the meat all the way off. Repeat with the rest of the drumlettes. Place the butterflied drumlettes in a bowl and cover with the marinade. Stir to coat evenly, cover and refrigerate for at least 1 hour. Cut the scallions into 3-inch long pieces and then split them half way down, lengthwise. 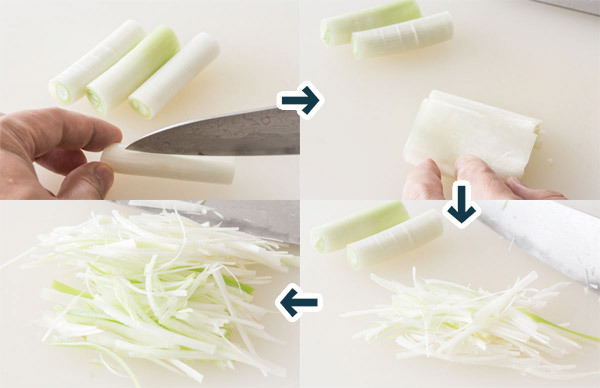 Unroll the scallions so they lay in flat sheets, then slice them into long thin strips. Add them to a bowl with 1 teaspoon of baking soda and fill the bowl with cold water. Let them sit in the solution for 30 minutes. 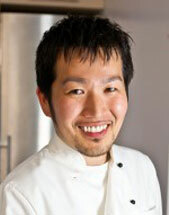 Add the ponzu to a small bowl and whisk together with the yuzu kosho. Drain the scallions and run them through a salad spinner to dry. Pour 2-inches of vegetable oil into a heavy bottomed pot and heat until the oil reaches 340 degrees F (170 C). Lightly dust the meat portion of each wing with the potato starch. Because of their shape I find it’s easiest put the potato starch in a bowl and then use a spoon to sprinkle the extra potato starch onto the top surfaces of the chicken, whacking the wings a few times on the side of a bowl to knock off any excess starch. Fry, the chicken wings until golden brown. They will not take as long to fry as a regular wings since they are butterflied. If your wings are large, you may need to roll them around a bit to ensure the meat and bone portion are all cooked through. 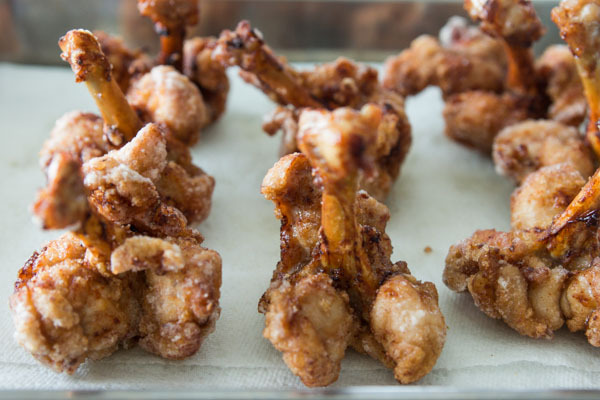 Transfer the fried wings to a paper towel lined rack to drain. 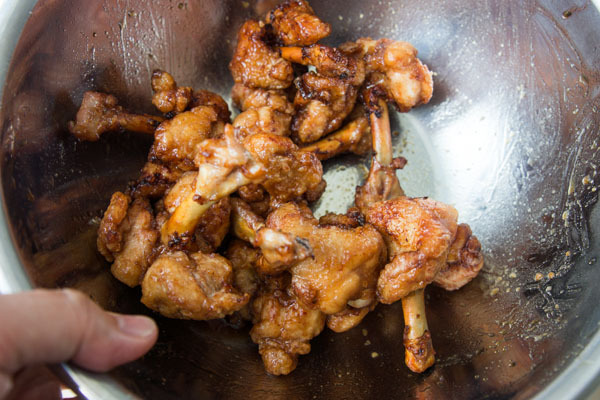 When you’re done frying the wings, put them in a large bowl and pour the ponzu on top of the wings. Use a tossing motion to evenly coat the wings with ponzu. Plate the wings and garnish with the tamed scallions.